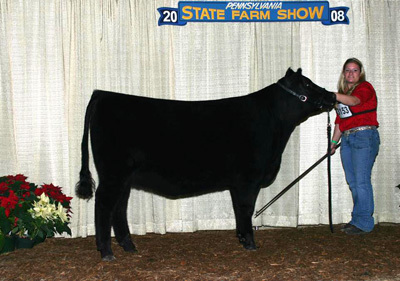 The junior Angus show was held on Sunday, January 6, 2008 with 82 females presented to judge Bob Gobal, MI. 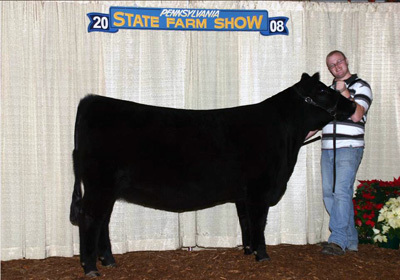 Grand Champion female was exhibited by Kurt Long, Airville, PA, with LVA GRF Ginger 605, a May 2006 daughter of Champion Hill Edition 2029. She first captured the Intermediate division. The reserve grand champion female spot and Grand Champion bred and owned was captured by Michele Landish, Northampton, PA, with Langus JEA Katinka 621, a December 2006 daughter of SAV 8180 Traveler 004. She first topped the Senior Heifer Calf division. The reserve grand champion bred and owned was owned by Freddy Frey, Quarryville, PA, with Freys FCF Elissas Elba, a February 2007 daughter of Freys Cavalier. She first topped the junior heifer calf division. The junior heifer calf champion was the reserve grand champion bred and owned for Freddy Frey, Quarryville. The reserve heifer calf champion was shown by Alysha Sweitzer, Wellsville, PA, with BCA Scaara Networth K714, a March 2007 daughter of SAV Networth 4200. The senior heifer calf champion was shown by Michelle Landis, Northampton, PA, who was named the reserve grand champion and also the bred and owned grand champion heifer. The reserve senior champion heifer was shown by Ryan Nolt, New Holland, PA with Triple N Dakota Misty, an October 2006 G13 Structure daughter. The intermediate champion was the grand champion junior angus heifer for Kurt Long, Airville, and the reserve intermediate champion heifer was BCA Black N Fancy K612 for Hannah Grim, East Berlin, PA. the junior champion female was shown by Alana Eisenhour, Wellsville, PA, with JDH WD VRD Sandy 0776, a February 2006 daughter of Vermilion Dateline 7078. the reserve junior champion female was shown by Katrina Frey, Quarryville, PA with Freys KJF Ark Pride K32-R36. Katrina Frey also showed the senior champion female with Freys KJF Delia M90-R04, a December 2005 daughter of SAF Connection. The reserve senior champion female was shown by Katie Nolt, New Holland, with Triple N Cheyenne, a September 2005 daughter of WCC Special Design L309. In the registered Angus steer show the grand champion was shown by Sarah Lownes, Honey Brook, with Gambles Bando 9246, a son of SAV 5175 Bando 0395. He weighed in at 1290 pounds. The reserve grand champion Angus steer was shown by Spencer Weimer, Emlenton, his May 2006 steer was a son of Juneau. LVA GRF Ginger 605 won grand champion female at the 2008 Pennsylvania Farm Show's Junior Angus Show, January 6 in Harrisburg, Pa. Kurt Long, Airville, Pa., owns the May 2006 daughter of Champion Hill Edition 2029. She earlier won intermediate champion. Bob Gobal, Alto, Mich., evaluated the 82 entries. Photo by American Angus Association. Langus JEA 004 Katinka 621 won reserve grand champion female and grand champion bred-and-owned female at the 2008 Pennsylvania Farm Show's Junior Angus Show, January 6 in Harrisburg, Pa. Michele Landis, Northampton, Pa., owns the December 2006 daughter of S A V 8180 Traveler 004. She first won senior heifer calf champion. Bob Gobal, Alto, Mich., evaluated the 82 entries. Photo by American Angus Association. Photos were taken by David Mullins, American Angus Association and Linde’s Livestock Photography.